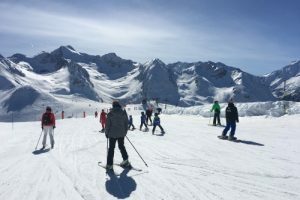 What will strike you the most if you’re coming skiing in the Pyrenees for the first time is just how low-key, relaxed and un-hurried the ski scene is compared to skiing in many resorts in the Alps. The vibe is relaxed and the lack of a crazy apres-ski scene means the Pyrenees resorts are ideal for families looking for a low key winter holiday. In addition to skiing, you can also enjoy the thermal spa facilities and numerous snow-based activities which are on offer in and around the ski resorts. 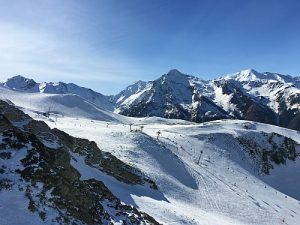 The Adventure Creators’ winter holidays are based in the central French Pyrenees where the main ski resorts are Peyragudes, Luchon Superbagneres and the small but perfectly formed le Mourtis. Peyragudes is the largest ski resort in the area in which we currently operate. It’s in a spectacular setting, surrounded by numerous peaks over 3000m. The resort’s claim to fame is that it was the location for the opening sequence of the James Bond film, Tomorrow Never Dies! The 51 runs which range from 1600m up to 2400m alt cover over 60kms with skiing for all abilities. With 6 greens, 23 blues, 18 reds and 4 black runs, the intermediate skier will be in their element here. The fabulous red run, la Vallée Blanche, is an epic run which comprises a combined vertical drop of almost 1000m – wow! Those who are seeking some lessons during their ski holiday will be impressed by the ski school at Peyragudes which is accessible to all. Fabulous local gastronomy and a warm welcome are the order of the day here with none of the break-the-bank prices that characterise a skiing holiday in the Alps. 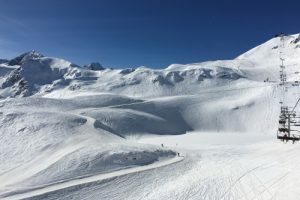 In addition to the piste skiing, the Peyragudes ski resort also includes 2 Freestyle areas, 2 free sledging areas, a Fun Slope, 2 free way-marked ski touring and snowshoeing itineraries as well as a fabulous thermal spa facility. The Peyragudes resort is an ideal base from which to enjoy our winter multi activity holiday. There are numerous snow-based family activities in and around the resort including igloo-building, riding with huskies, yooner, snake sledging, fat biking in the snow and snowshoeiing! There’s a shuttle facility from the town of Bagneres-de-Luchon up to the resort. If you opt to stay in one of the excellent quality apartments in-resort you don’t need to worry about car hire. There’s a transfer from Toulouse Blagnac airport up to the Peyragudes ski resort. It runs a couple of times a day every Saturday whilst the resort is open. 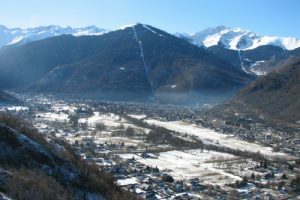 The beauty of the Luchon Superbagneres ski resort is that it’s accessible by gondola direct from Luchon town centre. In 8 minutes you can be up at the resort enjoying those panoramic views. The ski resort is divided into three areas and offers 32kms of varied skiing for all levels ranging from 1465m to 2122m alt. The majority of the runs are blues but there’s a healthy sprinkling of greens, reds and blacks too to keep everybody happy. Long mellow runs flow down from the Céciré top station whilst children and beginners will love the gentle runs through the forest. Kids can learn to ski in the lively, fun and secure Kids Park or may prefer to throw themselves down the dedicated sledging arena. Older children looking for some more exciting fun may spend a couple of hours in the snow park. 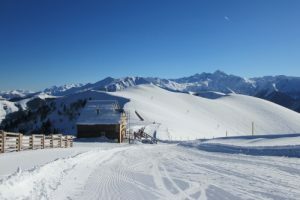 Numerous snow-based activities for non-skiers take place up at the Superbagneres ski resort too. Airboarding, yooner, snake sledging, snowshoeing, paragliding and even a fat bike descent of the slopes provide tons of fun for adults and kids of all ages. At the end of a day of snow-based fun, pay a visit to the only natural hammam in Europe, the Vaporarium back down in the town of Luchon. Le Mourtis is one of the smallest ski resorts in the central Pyrenees but is just perfect for a family day on the slopes. The resort goes from the village at 1350m alt up to the top station which is at 1860 alt. There are 23kms of runs at le Mourtis, made up of 4 greens, 5 blues, 7 reds and 3 black runs. Families and children in particular are well catered for here. There are two ski schools and a dedicated sledging area for the youngsters. In addition to skiing, the little resort is bustling with other activities that you can enjoy on our family winter multi activity holidays. There’s a dedicated airboarding slope, waymarked XC skiing and snowshoeing circuits, fat biking, wilderness experiences and an outing on snowshoes with a pulk including a chocolate fondue experience! 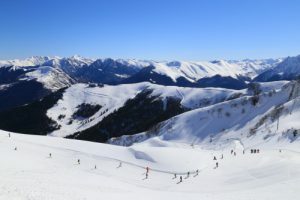 Whether you’re looking for a winter skiing holiday based in-resort or a family adventure holiday based in Luchon with skiing included, the family friendly ski resorts of the central Pyrenees have got options for all.